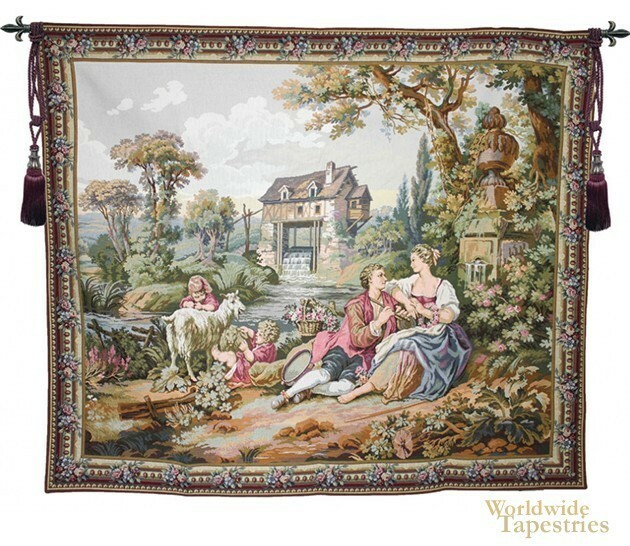 In Repos Fontain II or Foundtain Rest II tapestry, we see a scene of lovers by the lakeside amongst the children and goats, based on the works of Francois Boucher. This scene is part fo a series fo tapestries showing the life and times of French countryside, in a style that shows it in an idyllic form, and was a departure from art portraying the gods and royalty, in an era of French art that developed rapidly at the time. Here we see a scene where the lovers are resting by a large fountian, and there are children playing near a goat, among the river that flows and a house in the background. Repos Fontain II tapestry is backed with a lining and a tunnel for easy hanging. Note: tapestry rods and tassels, where pictured, are not included in the price. Dimensions: W 73" x H 63"